The term southern Europe, at different times, has had different meanings, providing additional political, linguistic and cultural context to the definition in addition to the typical geographical, phytogeographic or climatic approach. Most coastal countries in the United Nations-designated southern Europe border the Mediterranean Sea. Exceptions are Portugal which has only Atlantic coastline, Serbia and the Republic of Macedonia, which are landlocked, and Bulgaria, which borders the Black Sea. Geographically, southern Europe is the southern half of the landmass of Europe. This definition is relative, with no clear limits. Southern Europe's most emblematic climate is that of the Mediterranean climate, which has become a typically known characteristic of the area. Those areas of Mediterranean climate present similar vegetations and landscapes throughout, including dry hills, small plains, pine forests and olive trees. Romance languages and modern Greek are the heirs of Latin and ancient Greek as the main historical languages of the Mediterranean area. Albanian is also a language rooted in southern Europe, spoken in the Balkan peninsula. 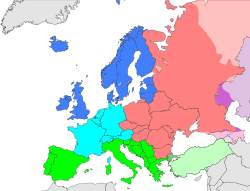 Slavic languages that are now spoken in southern Europe are not rooted in the Mediterranean area nor spoken mainly in those areas: In that sense those languages are not part of the linguistic definition of southern Europe, since they are logically associated with their "core". That said, southern Slavic languages form a quite homogenous area, geographically separated from north Slavic languages by Hungary and Romania. Due to the English colonisation in Malta and Gibraltar, Germanic languages have a little presence in southern Europe, far from the core of Germanic languages in northwestern Europe. Malta uses English as a second language in some cases (after Maltese, which still is the original and main native language). In Gibraltar, English is the official language but Spanish and Llanito (mix of Andalusian Spanish with some English) are also spoken. The Basque language is a linguistic isolate spoken by the Basque people, who inhabit the Basque Country, a region spanning an area in northeastern Spain and southwestern France.